Students gathered outside of the Genome Science Building Monday night to protest the speech of former President Donald Trump deputy assistant Sebastian Gorka. Gorka was in town to talk about the United States’ relationship with Israel and what the current administration is doing to strengthen the connection. The protests called for recognition of Palestine as an independent state. Despite the noise outside the building, Gorka’s event went smoothly with no interruptions. “This is an event to let people know what our current presidential administration is doing in terms of Middle East Policy,” said Will Rierson from the UNC College Republicans. 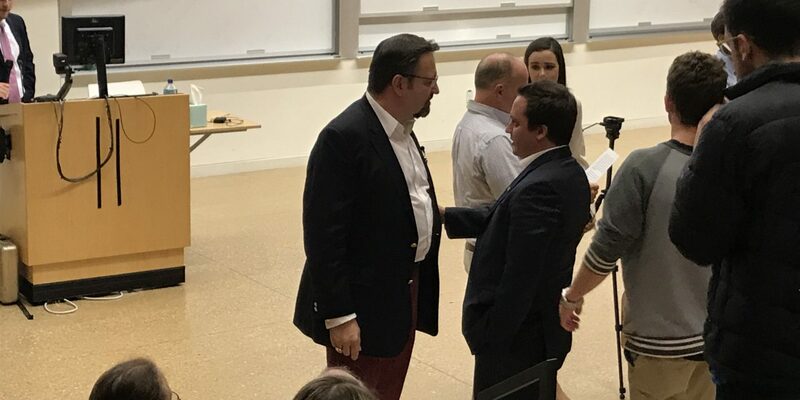 Gorka took questions from the audience and touched on a number of other topics including his relationship with the president, how he got involved with the campaign and the Trump family’s connection with Russia. The event was sponsored by Christians United For Israel, with co-sponsorships from UNC College Republicans and Turning Point USA.